The Blauwe Boulevard of Hasselt is taking shape. The dock was lowered next to the water and a wide pedestrian-bicycle track leads visitors and new residents. The mayor Hilde Claes wants the “Kanaalkom” become the showcase of Hasselt, a new focal point of the city. The construction quality and the materials used for both residential areas and for the common areas leaves no doubt about the quality of the final result that will be valuable in a few years. In this context, fits the lighting design, built between 2011 and 2013, right after the approval of the Lighting Master Plan of Hasselt (the assignment included the development of two projects). Water in all its shapes (kanals, rivers, ponds, docks, ...) always has a big impact on the identity, the ambience and the coziness of an environment. 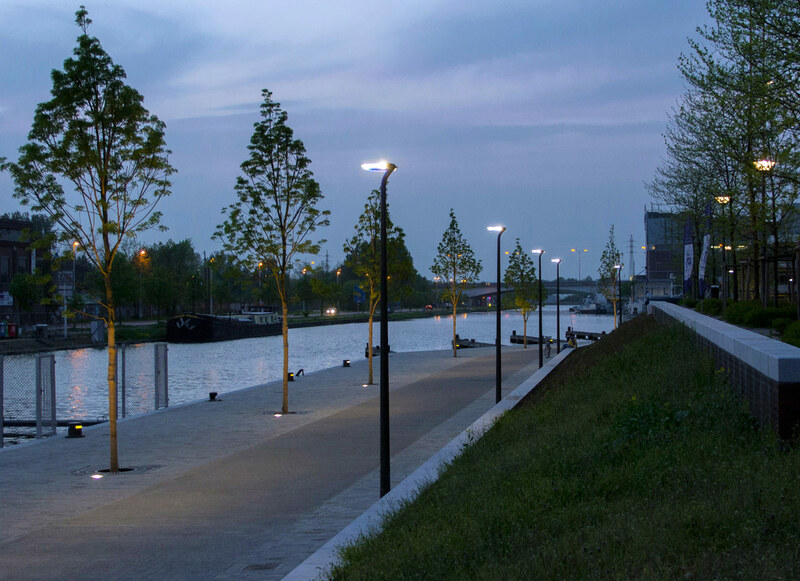 Especially in large water surfaces, as the Blauwe Boulevard, the choice of the light is crucial in order to strategically link the identity of the city to the presence of water. Two main zones were defined in de Blauwe boulevard area: a more quiet and silent, the Oostkade, and a more lively and active, the Westkade. The vocabulary used in both zones is similar in the sense that the relation with landscape and water plays the main role but, also visually, the two areas are different. While in the Oostkade there are no obstacles in front on the water and only the effects of the lighting are perceivable, in the Westkade the lighting system is visible and serves also as an orientation reference for the sailing boats. The relationship with the water in the Oostkade is still guaranteed by the choice of recessed lighting fixtures, bollards and subtle poles. This in order to minimize the visual impact and the physical obstacles along the ‘kade’ (quay). The lower lighting levels and the uneven pattern of lights and shadows is intended to emphasize the character of the Oostkade. The lighting layout provides a relaxing and romantic atmosphere. It is also inspired by daylight lighting effects, with the light and shadow effects on the horizontal surface as suggested on the square nearby the downtown area which is the focal point of the urban project. The lighting for the central area of the square is playful and inviting due to lighting projections on the ground and the accent lighting around the benches. On the perimeter of the square the lighting is achieved by ‘decorative’ poles which contributes to the general lighting and also have a diffuse effect on the trees in the surrounding. A few modifications of the original project took place during implementation, an issue common to many projects...Some luminaires where not installed or don’t match the specs but despite that the project remains strong, inviting and meets the wishes of the city and the inhabitants.